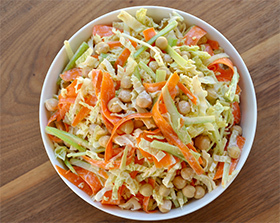 If you love coleslaw, then this salad recipe will quickly become your new favorite. While most coleslaw recipes contain a heavy, creamy dressing this one is made with guilt-free Greek yogurt. We’ve also added in some chickpeas for the boost of protein and fiber. Make an effort to lighten up more of your favorite recipes by employing techniques like swapping out heavy cream for Greek yogurt or swapping refined sugar for coconut palm sugar or stevia. It’s small dietary changes like that over the long haul that will ultimately make the biggest impact on your health and fitness. Enjoy! In a medium bowl, stir together the yogurt, vinegar, water, salt, and pepper to taste. Add the chickpeas, cabbage, celery, and carrots; toss to combine. Transfer slaw to a plastic food storage bag and chill at least 4 hours before serving; slaw keeps up to 3 days.